(NaturalNews) I want to thank readers of Natural News for your support of our Kickstarter campaign. 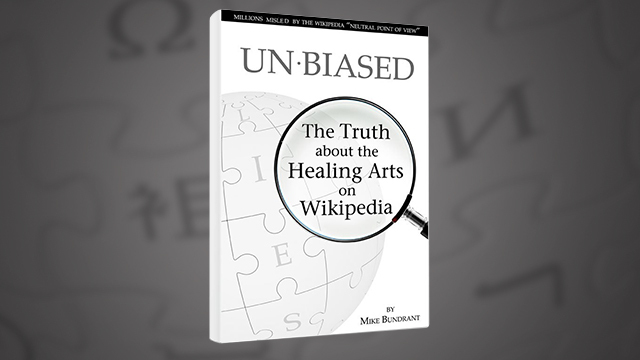 After the first day and a half, we had 140+ backers and $6,000 dollars pledged for Unbiased: The Truth About the Healing Arts on Wikipedia. And we are also getting some backlash from the "scientific" community. It seems that some feathers are being ruffled. This makes sense. The existence of a book that legitimately challenges the authenticity of the sixth most popular website in the world is a gust of wind that threatens an intellectual house of cards. • Backers are lining up in support of this project! Even as I type, notifications are coming in from Kickstarter. We anticipate that this campaign will continue to snowball as word gets out. • Messages of support are coming in by the hour through Kickstarter. People seem grateful for the effort we are making. I just read about your upcoming book via Natural News and wanted to get in touch with you. I am a traditional Ayurvedic Physician (only the 2nd American to complete this course, btw). I would be interested in providing information or helping you out with anything related to Ayurveda for your book, if you need it. For example, there are over 10,000 clinical studies (yes, scientific!) on NIH right now under Ayurveda. No one talks about this though, nor do they mention the millions of $$ that go to funding Ayurvedic clinical studies every year in India (again by the NIH and related groups). • Plenty of criticism: Yes, this is a good thing. Nobody who takes a stand does so without backlash. This is a sign that we are on point. • CHART Natural Cancer Healing -- after some intense questioning -- has endorsed the campaign and will be sharing it in their circles. • I've been invited by one Wikipedia health editor (who donated to the campaign) to engage the Wikipedia medical forum for discussion and debate. If this is a sincere offer, it is an opportunity to make some headway. On a personal note, it's just been a couple of days, and this is already a roller coaster ride for me. So, again, I want to thank readers of Natural News -- and especially Mike Adams -- for the support and encouragement. Interestingly, I am also seeing comments from people about the funds I am seeking for this project. Some suggest that what I am asking for is not nearly enough. Others think I am asking for too much. The truth is, I have done the math and am seeking the exact amount needed to do the job right. Together, we're going to make this happen! Please read the Kickstarter campaign here.